There are reports that all is not well between Meena and hubby Vidyasagar. The buzz in Kollywood is that Vidyasagar is not so keen on Meena donning the greasepaint but the lady appears to be keen on continuing her career. 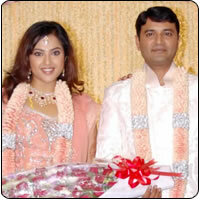 Apparently, the tiff between the couple broke out when Meena agreed to star in a Malayalam and Kannada film. When the actress was contacted to find out if there was any truth in this, she denied it and said they are all just baseless rumors. Does it mean that the lady will quit acting to settle for a quite family life?